A muff is a fashion accessory for outdoors usually made of a cylinder of fur or fabric with both ends open for keeping the hands warm. It was introduced to women's fashion in the 16th century and was popular with both men and women in the 17th and 18th centuries. By the early 20th century, muffs were used in England only by women. It is also reported that the fashion largely fell out of style in the 19th century. It briefly returned in the late 1940s and 1950s. 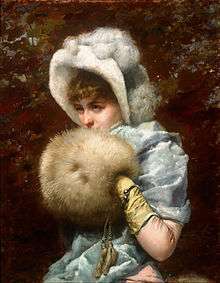 In Roman times, the place of the glove was taken by long sleeves (manicae) reaching to the hand, and in winter special sleeves of fur were worn. In Medieval Latin we find the word muffulae, defined by Du Cange as chirothecae pellitae et hibernae ("leather winter gloves"). He quotes from a cartulary of the year 817, of the issuing to monks of sheepskin coverings to be used during the winter. These may have been, as the Roman certainly were, separate coverings for each hand, although the cartulary cited also distinguishes the glove for summer from the muffulae for winter wear. The Old French moufle meant a thick glove or mitten, and from this the Dutch mof, Walloon mouffe, and thence English "muff", are probably derived. 1 2 Chisholm 1911, p. 955. This article incorporates text from a publication now in the public domain: Chisholm, Hugh, ed. (1911). "Muff". Encyclopædia Britannica. 18 (11th ed.). Cambridge University Press. p. 955.